Our dinner meetings, the second Wednesday of each month, are a fun time to socialize with new and old friends. A lively happy hour from 6-7 is followed by dinner from 7-8. Open seating at tables for 8 allows for extended conversations. From 8 – 9 we have announcements on coming events and special programs. Happy hour is always open, however reservations for the catered dinner must be made by the Sunday before the meeting. Your guests are always welcomed to any club function. Once a month you are invited to a casual dinner at the club. Five dollars and a ‘side dish’ is your ticket to a fun evening, with an open bar and the main course prepared by volunteer club members. It’s casual, sometimes a theme like St. Patrick’s Day, no reservations required. Held every fall, the salmon dinner is your opportunity to enjoy your fill of seafood while socializing with other club members and guests. October’s TGIF finds the club wildly decorated, costumes encouraged but not a necessity, dancing, and of course, wonderful food; all this for $5 and a side dish! You don’t do costumes, can’t dance?? Come anyway, it’s a blast!. Ring in the New Year close to home with your friends and guests. Enjoy fine dining, champagne toasts and dancing to a live band. A breakfast is served at the end of the evening to send you off safely home. 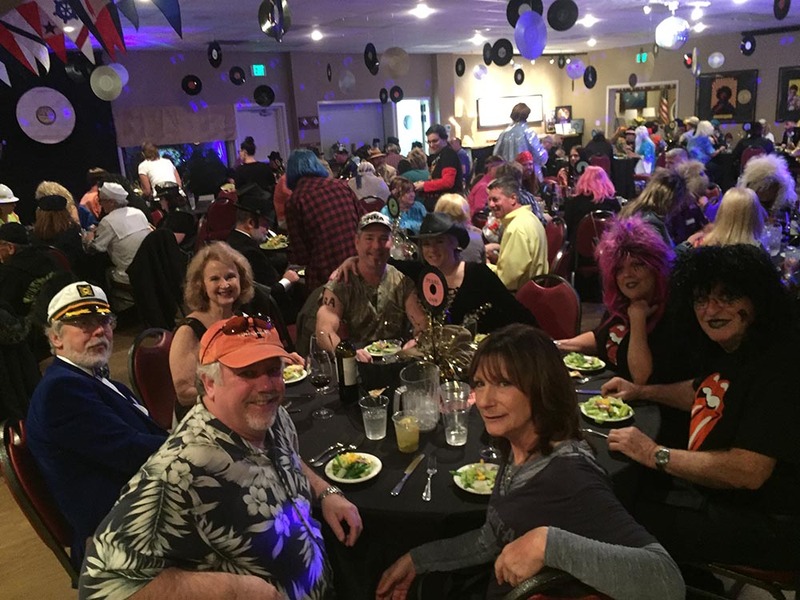 A fun, lively themed dance is held every other year to honor our Rear and Vice Commodores and those of the other Grand Fourteen Clubs. Costumes are encouraged, but not required. If you like seafood, this is the event for you! Some years it’s a shrimp boil; other years it’s a crab feed. Held in the dreary months of January or February, it’s a welcome reminder that summer fishing is just around the corner. This is the major fund raising event for improvements to our Club. It’s a fun social evening with dinner, several tables of silent auction items, fabulous desserts and an exciting live auction of valuable items and events donated by our club members. Our Club is beautifully decorated for this dressy evening to honor and say ‘thank you’ to our Commodore for four years of service to GHYC. This event, open to all members and their guests, features a fine dining menu and dancing to a live band. Women’s Interclub Council sponsors a monthly luncheon and informative program at one of the Grand Fourteen Yacht Clubs. Once a month women from GHYC carpool to one of these meetings. It’s a great way to meet other women from around the Puget Sound who are interested in boating. Two or three events are held throughout the year; sometimes it’s dinner, others might be an art project or a mystery destination. Whatever the event, GHYC women know how to have fun! These enjoyable lunches are held each Thursday at the Club. Reservations required via email to kellyjar2@gmail.com; enjoy casual lunch and conversation with other members. Fourteen yacht clubs in the Puget Sound banded together over 75 years ago to support recreational boating. Gig Harbor Yacht Club, along with Seattle YC, Tacoma YC and 11 other clubs are members of this exclusive group. You are invited to enjoy the facilities and moorage at each of these clubs, including dining at Seattle and Tacoma Yacht Clubs. One of our most popular ongoing programs; sign up to participate in the fall. Four times a year dinners for eight people are held in members’ homes. One dinner you are the host; the other three you bring a dish and spend an evening laughing, talking, getting to know each other. Three or four times a year GHYC hosts an ‘education night’ open to the public. Outside speakers or GHYC members present topics of interest to boaters. GHYC hosts this traditional gift to the city of Gig Harbor. All decorated boats, do not have to be Club members, are invited to join the parade, twice around the harbor. Decorate your own boat, ride along with friends, or watch from shore. Twenty to thirty lighted boats is a spectacular December tradition. TYC’s big weekend event of the year is held in April. Come with or without your boat; help decorate the GHYC boat entry for the Daffodil Boat Parade; cheer on our Rear Commodore in the Trivia contest ; enjoy dinner and dancing at TYC. The first weekend in May, SYC sponsors the “Opening Day” of the boating season. Bring your boat or come by car to participate in the many activities of the weekend. Help decorate GHYC’s entry in the boat parade. This international event draws entries from all over the world, beginning with the UWA rowing competitions; then the boat parade with several different catagories: yacht club officers’ boats, classes of boats; and the competitive decorated boats. Cap off the weekend with a private dinner and dancing in the historic Seattle Yacht Club. A weekend of events not to be missed. Gig Harbor Yacht Club is an active boating and social club that celebrates camaraderie and boating activities. We have a positive environment of sharing knowledge and good times. Our Social Calendar is full of cruising, racing, and land-based activities that are 100% volunteer in their organization and support. We have monthly Dinner Meetings, education nights, TGIF casual evenings, cruises, special Balls and holiday parties. We are active on the water as well. Check out our Boating link to explore our monthly cruises, and our participation in the Puget Sound’s Sail Racing and Power Boating competitions.